To start the calendar sync you need to allow Yoxel to access Teamwork and Outlook calendars and then to configure the calendar sync rule. To allow Yoxel to sync calendars you need to navigate to your Yoxel sync page (from 'My Profile' -> 'Integrations'), expand Teamwork and Outlook (Office 365) services, and make sure that Calendar sync is selected for both services. After selecting Calendar sync modules, click the Save button. You can sync up to one year of past events and two years of future events. By selecting “Sync private events” option you will authorize Yoxel to sync your private events to and from Teamwork. To enable bi-directional sync select "Allow updating, creating, deleting". And to enable one-way sync from Teamwork to Outlook select "Prevent any modifications" option. This option will not allow Yoxel to sync any changes you make in Gmail back to Teamwork. 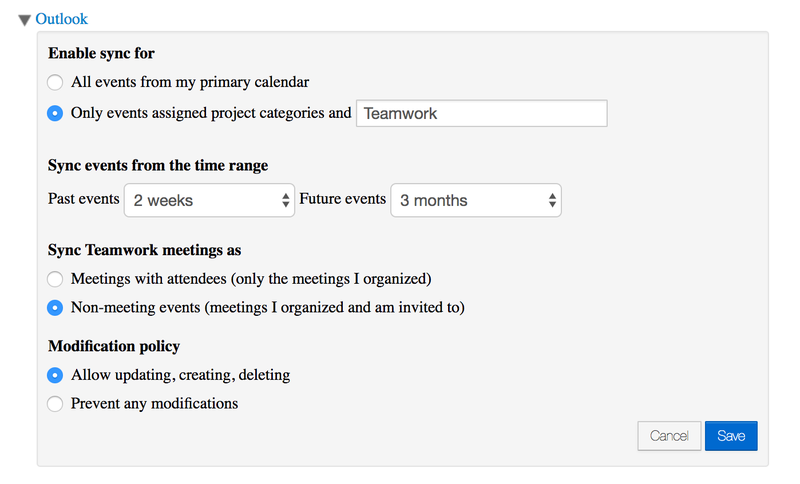 For Outlook you can enable Yoxel to sync either all events from your primary calendar “All events from my primary calendar” option, or only those that are assigned Outlook categories named after your projects, “All events from project categories and” option. If you choose the second option for syncing, Yoxel creates the the project categories when syncing Teamwork events and milestones to Outlook. You can then sync Outlook events directly to Teamwork projects by creating them in Outlook and assigning those project categories. You can sync up to one year of past events and two years of future events. "Sync Teamwork meetings as" is not supported at the moment as Teamwork does not have the "meeting" concept with clear specification of attendees. Please use the second option for now, "Non-meeting events". To enable bi-directional sync select "Allow updating, creating, deleting". And to enable one-way sync from Outlook to Teamwork select "Prevent any modifications" option. This option will not allow Yoxel to sync any changes you make in Teamwork back to Outlook.